Several months ago a friend blogged about the "stuff" of her life; items in her writing space that had stood the test of time. Regardless of the number of moves, spring cleanings, de-clutterings or donations, these items had survived. I love my home office. It's a warm, cozy room that both soothes and inspires. As I looked around my office, after reading her blog, the reason for that calm and welcoming atmosphere became apparent. Without realizing it, I had surrounded myself with my own special "stuff," treasured keepsakes representing people and events in my life that I hold dear to my heart. As I took stock, I have to admit I was a bit shocked when I started counting up the years that some of these items have been with me; the number of moves (eight residences in four states for some of them) they had survived. Here are a few of the items that have stood the test of time. My bronzed baby shoe holds the distinction of being with me the longest. Do they even do that anymore? 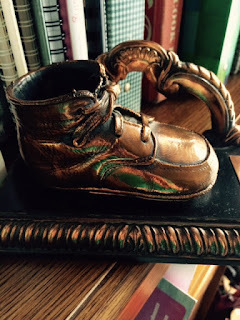 Back in the day, parents would have their baby's first shoe bronzed as a keepsake. Mine is engraved with my name and date of birth and, these days, functions as a bookend but it also serves as a reminder of my mom and dad as young parents, bursting with pride and love for their first born. Did I mention that I collect frogs? Once upon a time, I had a huge collection but much of it went to new homes when I downsized to the condo where I now live. Not the first one though. That's him over there on the left. He was a Christmas present from younger brother #3. He's graced apartments, townhouses, multiple homes and now has a place of honor in my condo office. He reminds me of that teenage boy, making minimum wage, who managed to save enough money to buy his big sister something special. He's not going anywhere. When I was sixteen, I spent the summer studying in Europe. I brought home several souvenirs from that trip but most have disappeared over the years. One that has not is a chalet music box that I bought at a small shop high in the French Alps. It graced my bedroom desk while in high school, went with me to my college dorm, then to my first apartment and so on. It plays Le Vieux Chalet and I've long since lost count of the number of hours it's been played but it soldiers on. It wasn't expensive, probably cost less than $10 but for more than 40 years it's continued to play and each time I hear the tune it takes me back to a beautiful flower-filled meadow high in the Alps and the joy of one magical summer. This sign has only been with me a couple years but every time I look at it my heart melts a bit more. 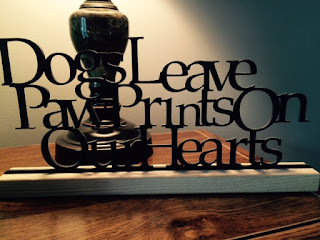 I can't help but be reminded of all the wonderful dogs who have shared my home over the years. Big or small, long-lived or short, each and every one of them has left their paw prints on my heart. 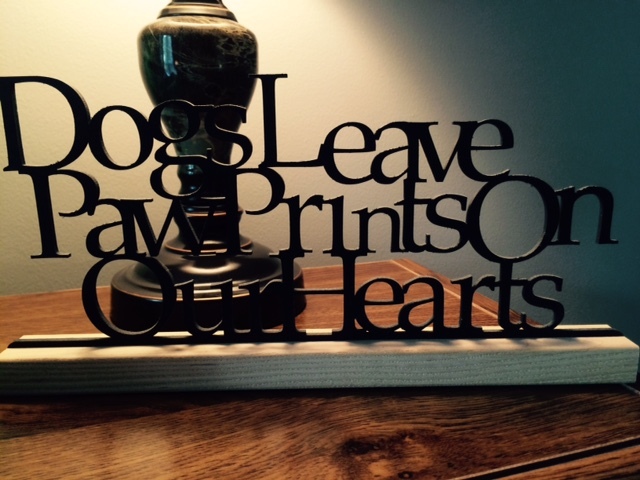 Wherever life takes me, this sign will be with me as will the memories of the furkids I was blessed to know. 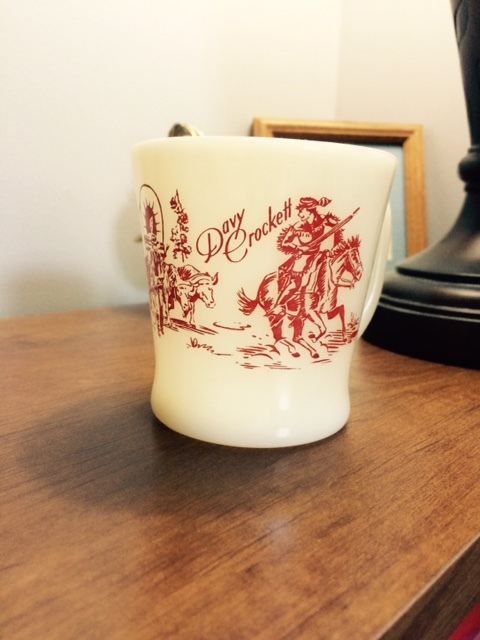 Okay, who remembers the Davy Crockett television show? There's probably only a handful of you who watched it when it first aired (in the 50's) but some of you may have seen it on nostalgic TV channels. I don't remember exactly when I was given this mug but I know I was in grade school. That's 50 years ago, people. Fifty! How I've managed to not break it in all those years I'll never know (sure hope I'm not jinxing myself) but it doesn't even have a scratch or a crack. It's not worth all that much but every time I look at it I'm reminded of a simpler time, a carefree childhood and the warmth of being secure in my parents' love. 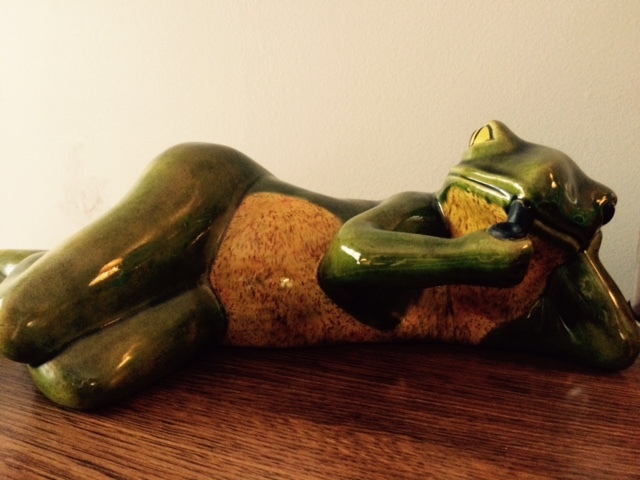 As soon as I saw Louie the Frog, I knew he'd be the perfect birthday gift for my step-mom. She was in the early stages of Alzheimer's and my dad had been diagnosed with terminal cancer earlier that summer. It had been a rough few months and was going to get more difficult but this sweet, singing frog was a reminder of all the joy their union had brought and that it was indeed a wonderful world. During the time my dad had left, Louie serenaded them over and over, never failing to bring a smile to them both. He continued to bring comfort to my step-mom in later years when she no longer knew us. Though both my dad and step-mom have been gone for years, each time Louie sings to me they are here, in my heart, reminding me to reach for the joy of the wonderful world in which we live. Last, but not least, are the books. Good friends, all. Some old, some new, some I've yet to read and others I've revisited time and again. 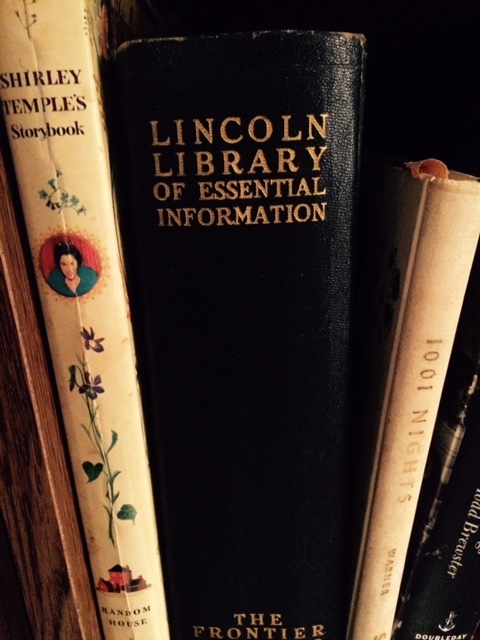 Three special volumes are Shirley Temple's Storybook, The Lincoln Library of Essential Information and 1001 Nights. The Lincoln Library belonged to my late husband. It was a gift from his mother on his 12th birthday and is personally inscribed. It traveled the world with him during his Air Force career and was one of his most treasured possessions. The other two were gifted to me. My parents gave me the Shirley Temple book for my ninth Christmas and it includes my mom's handwritten inscription. I have precious memories of her reading me stories from the book and I've read many a story from it to others little ones in my life. When I was a young child, my family was "adopted" by one of my dad's clients, a lovely widow who lived on a farm just outside our small town. She had no children and we became surrogate grandchildren to her. When I was seven, she gave me 1001 Nights, a fascinating collection of wondrous tales like Aladdin, Scheherazade, and Ali Baba and the Forty Thieves. I think she would be pleased to know that all these years later I still enjoy traveling to the mysterious lands of 1001 Nights. Now it's your turn. Tell me about your treasured keepsakes. How long have they been with you? What makes them special? Do they surround you with a feeling of comfort and joy? What a wonderful blog. I'm a total packrat so it's very hard for me to narrow it down. Everything seems sentimental to me. My mom was the total opposite and threw almost everything away. I do have a wooden cart that came from Sicily (all my ancestors came from there). It's decorated for a parade and the horses too. I'm afraid it got passed around and it shows it but I was thrilled to end up with it - it's one of the few things I own from childhood. That and two Christmas ornaments - my sister was married first so she got most items but I begged for at least two lol. I have so many wonderful possessions from many trips when we traveled and gifts that I've been given (especially homemade ones). My Christmas ornaments are very dear to me. And books,,,I could open a library lol. How cool that you have the wooden cart from your childhood. I don't think it matters if it's well used (I like to say well loved). It's the memories attached to it that count. my trerasures are my precious moments ...each one means something to me my kids birth their baptism etc We were broke and I was thinking of selling them but things worked out so they were saved.. So glad you were able to save them but even if you hadn't be able to, the most precious moments are the ones that live in your heart. My dad's fiddle (which was also grandpa's and great-grandpa's fiddle). I believe my father made a trade for it; his sister had needed a bicycle for her son and dad traded his bicycle for it. My mom's bible; and also my dad's bible. Mom marked all over hers; but Dad's is worn from decades of use. When I hold them, it's like touching them again. My Harry Potter wand (from my sister) and my Severus Snape wand (from my Director)--MOST AWESOME GIFTS EVER. Different Christmases. My stuffed horse (about as big as a 4 year old)--I remember when I got it. I was four; and my aunt Helen gave it to me. I've had to put the stuffing back in a few times and sew it; and it's been through some trials, but it's a definite Velveteen Rabbit Status. His name is Prince. He's brown with white socks and a white blaze. Wow, if only that fiddle could talk. Imagine the stories! Do you play, Hellie? I have my grandma's bible. Reading from it is like a warm hug. I enjoyed learning about your wonderful and meaningful treasures. I have several old photograph albums of my parents and family which are precious and memorable. I have all the family photo albums too. I really need to start scanning those photos before they fade. My late father did soapstone sculptures for a short time. He gave many individuals these massive stone sculptures as gifts which are extraordinary. I have a few which I cherish and are a showpiece. These are my only legacy which are going to be for my sons and their children. I love soapstone sculptures! I had a couple I really liked but they went to new homes when I downsized. Having some that your father made is a wonderful gift to share with future generations. I've got some of those bronzed baby shoe bookends too! I loved the Davy Crockett stories - don't have a mug, but I do have a Hopalong Cassidy milk glass. Also a shaving mug of my grandfather's with his initials. I've thinned out a lot of things in recent years, but there are still many that I would have a hard time giving up - unless they went to family who loved them too. My grandpa had a shaving mug. I don't know what happened to it when he died. Lots of memories watching him shave with it though. I have a teddy bear that was made for me by a relative now deceased. It's been with me for about 25-30 years. What a lovely blog, PJ! Thanks for sharing some of your cherished mementos. My treasures include a trunk that belonged to my great-grandmother, my mother's well-marked bible, an orange bunny named Flannery, dozens of angels--each one a gift from a family member or a dear friend, and a certain Bon-Bon quilt. Then there are the books (especially those from my childhood and those that bear a personal inscription) and, of course, photographs. What a lovely post, PJ. I have things I treasure too. I have my teddy bear and stuffed elephant from when I was little, as well as some of my clothes and books when I was a child. I have my Mom's Bible and some of her books and, of course, many photographs. Christmas ornaments from when my children were little are really special -- bring back such happy memories. PJ, Thank you for always a bit of your heart and memories with us. What a great post today. I treasure the paintings my mother has done for me. She doesn't seem to find joy in painting much any more, but she painted the 5 that I have with me in mind. I treasure the Bible she gave to me as she inducted me into Eastern Star when she was the chaplain. I treasure a note from my daughter that she wrote all by herself when she was 6...especially now that she is a teen, and I really need prayers for the next several teen years, ha! I treasure the bubblegum ring my husband gave me when he couldn't afford a real diamond to ask me to marry him. Awww... thanks for sharing your memories! I only really have a few. The first is a crystal butterfly light catcher. It was my grandmother's and it's at least 60 years old. It's on a high, high shelve and I never handle it so as not to risk breaking it. The other is my Little House on The Prarie box set that I got for Christmas when I was 12. Thanks for sharing! It's so interesting to read about other people's keepsakes. And I liked reading the comments here. I have several different kitchen items that belonged to my mother, one of which is a large Pyrex (I think) yellow bowl that is square at the top with a flat lid. We always had potato salad in it, and I have used it just a number of times, fearing I would break it. Our tea pitcher is Marshall pottery (with a blue stripe) that my parents used to sell at their feed store and is over 50 years old. Just writing about these makes me feel nostalgic. And then I have some first edition Nancy Drew books, carefully hidden on a seldom used bookcase. I have a ring that my Dad brought home from WW2 before I was born and would you believe the stone is an opal and I am an October baby. I also have a special ring that was my mom's; she gave it to me on my wedding day; it is also my birthstone. Would also like to mention that I have some knicknacks/and pictures that were my great aunts. She was a very special woman to our family. And how could I forget that she gave me her diamond ring before she passed away. What treasures reminding me of this very special lady. I am an older lady so I have cleaned out a lot of items; I had some jewelry of my mom's but unfortunately anything I had when my house was robbed was lost. So What I do have that I treasure are pictures and cards that my greatgranddaughter has made for me as well as school mementos of my own children, like report cards, etc. I have some lovely statues that were my moms. When I look at them, I remember her with love. I have all of the pictures, drawings, cards, ornaments and gifts my children made me. I have my great aunt Anna's hope chest. I have my paternal grandmother Catherine's engagement ring. I have a stuffed leopard, Minerva, that my great aunt Anna gave me when I was 5. I still have the 5 speed Schwinn bike that I got the Christmas I was in 4th grade. I have my first Kodak camera.